Collar dams and snow accumulation can impede surface drainage and increase the risk of thaw and freeze injury. It’s hard to imagine opening a golf course to play when putting greens are still buried in snow, but spring is coming soon. Anxious turf managers at courses where playing surfaces are dominated by Poa annua have reported localized areas of turf under dense ice cover for at least 70 to 80 days, leading to serious concern about possible winter injury. For many, a spell of mild weather to melt snow and ice can’t come soon enough. With the Poa annua ice bomb ticking, many superintendents will exploit the earliest opportunity to accelerate the ice melting process by clearing snow from putting greens. However, when freezing temperatures occur overnight, melting ice can increase the risk of thaw and freeze injury to turf where impediments to surface drainage cause water to pool and refreeze at night. 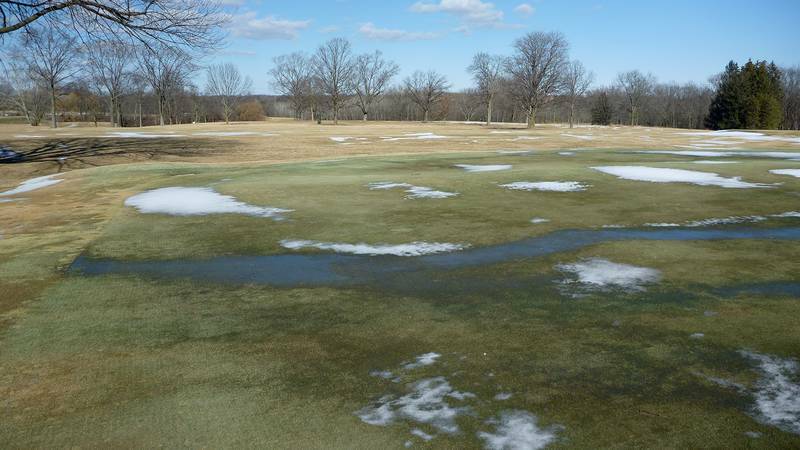 Sometimes adequate surface drainage is present across much of the green but an elevated collar or snow accumulation around the perimeter of the putting surface prevents free water movement. Dams caused by excess accumulation of sand topdressing in the collar can be breached by creating a channel through the elevated turf using a narrow sod cutter or even a spade, as long as the soil is not frozen. However, late winter isn’t the time to permanently fix collar dams. Eliminating temporary dams caused by snow accumulation is an easier fix since you are already removing snow from the putting greens. However, you need to know where excess water exits the putting surface to achieve the best results. This may be tricky during winter when sprinkler heads and other landmarks are buried in snow. Before the ground freezes, insert a 48-inch driveway marker into collar areas where water exits putting greens to help identify key sites for snow removal during late winter. You probably already have some extra markers if your duties include snow plowing. Part of being a good turf manager is managing risk. At some point, the risk of injury from ice suffocation is greater than the risk of removing snow and ice from the greens. This tipping point often occurs sometime during March. Just be aware of any surface drainage issues before you decide to give Mother Nature a helping hand with ice removal.